Voters described widespread issues at the polls in the tri-state area Tuesday, from long lines in Brooklyn to broken machines in New Jersey to late openings in the Bronx and hours-long waits across the city. Dozens of voters complained about broken ballot scanners in polling locations across New York City. Some who were asked to leave their votes in a ballot box refused, despite being promised they would later be scanned, highlighting the undercurrent of mistrust that has been present through the election. Others begrudgingly placed their ballots in what at least one voter called the "ominous" emergency box, expressing hope their votes would be counted. At PS 154 in Harlem, angry voters reported that only one ballot scanner was working, and that lines to vote were running about two hours long. Photos posted to social media showed voting rooms teeming with people. Lines for some polling booths in New York were around the block on Election Day morning. A voter complained that only one of five scanners were working at a polling location on West 127th Street. She said "no one seems to know what's going on," and that New Yorkers were leaving the location without voting after seeing the line. Other reports of broken scanners flowed in from multiple locations in Queens and the Bronx, where voters at PS 119 were complaining poll station staff were asking for identification in order to vote, which is not required by law. The city's Board of Elections tweeted a monitoring team was sent to the location. Registration was another reported issue. Voter roll books were reported missing or incomplete at the Esplanade Gardens, a six-building apartment complex in Harlem, when polls opened at 6 a.m., leaving more than 100 people to stand around and wait for 90 minutes. Voters were offered the option to vote via affidavit, but many declined, again out of concern their votes would not be counted. Elsewhere, lines were extensive. At least 300 people snaked along a block on the Upper East Side to vote on 88th Street. Roughly 200 people lined up outside PS 1 in Brooklyn Heights to vote before 9 a.m. Some voters reported cases of shoving in line, and security was called to contain the ruckus. The New York City Board of Elections' Twitter feed was a series of responses pledging technical assistance at locations where voters complained of broken machines and long waits. The board also assured voters wary of placing their ballots in emergency boxes that all votes would be counted. 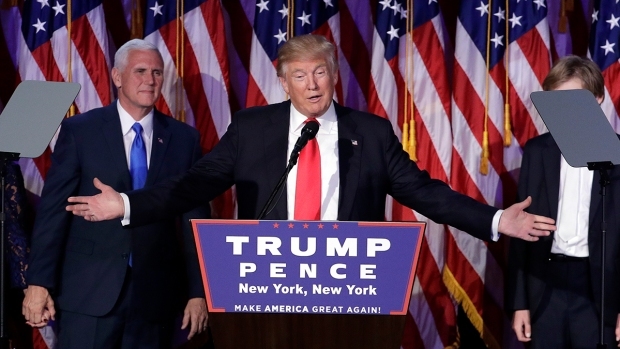 Both presidential candidates seemingly had no issues casting their votes in New York Tuesday -- Democrat Hillary Clinton in her hometown of Chappaqua and Republican Donald Trump in Manhattan, though Trump did encounter booing and jeers as he headed into his polling location. Mayor de Blasio, who also voted with no issues Tuesday morning, unleashed a tweet firestorm decrying the voting problems later in the day. He called for action on voting reform in New York state, suggesting early voting and electronic poll books to help alleviate long lines. 2/ First, I applaud NYC voters today for their determination to stand & be counted. Nothing is more important than your vote. 3/ Also, let’s thank & be patient with our poll workers. Without them the system simply would not work. 4/ That said, has it ever been clearer that we need voting reform? We need action here in New York State. 5/ 37 states offer early voting to help avoid long lines. There is no reason New York can’t become 38. 6/ 32 states offer electronic poll books to help streamline the wait time to vote. There is no reason New York can’t become 33. 7/ 27 States offer early “no excuse” absentee voting. There’s no reason New York can’t become 28. 8/8 The work of democracy isn’t limited to Election Day. We must continue to work to meet a voting standard worthy of all New Yorkers. Busted scanners compounded wait times across the river, too. In Jersey City, a woman said a broken machine at Mary Bethune Center caused a one-hour delay in the opening of the polling site. The woman said voters were told to fill out ballots or come back at a later time, but there weren't enough ballots for the amount of people waiting. The Hudson County Board of Elections was called, but said they were short-staffed, the voter said. Most districts across Hudson County only get one machine, according to Hudson elections supervisor John Brzozowski. And the ballot is longer since school board elections in many cases switched to the fall. Brzozowski says despite the lines, many voters will only vote in the presidential election so it just isn't worth the money at this point to buy any more machines. 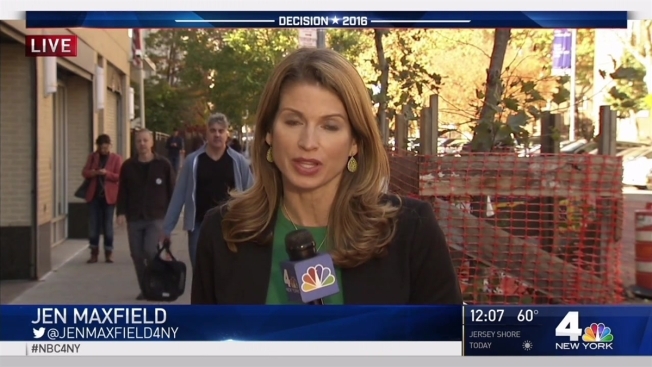 Frustration affected poll workers in Connecticut, where one voting machine tech unplugged and shook an optical scan machine when it stopped tabulating votes early Tuesday, Farmington Registrar of Voters Edward Leary told NBC News. The machine was out of commission for several minutes, during which time voters who had to get to work were advised to leave their paper ballots in a locked bin on the side of the voting machine -– a standard practice in Farmington that is allowed whether a machine is broken or not. 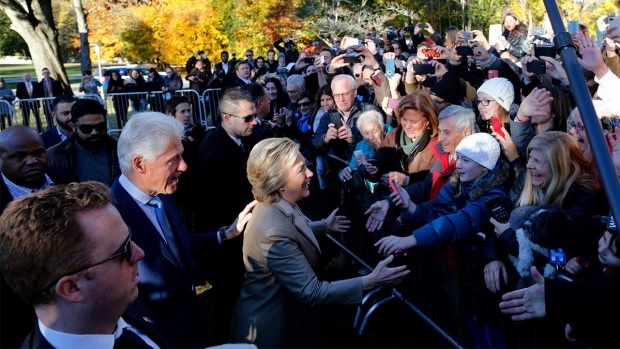 Crowds cheered Democratic presidential candidate Hillary Clinton as she stepped out of her vehicle to cast her vote in a school in her hometown of Chappaqua Tuesday morning. To combat anticipated problems, the nation’s largest nonpartisan coalition of more than 100 organizations, led by the Lawyers' Committee for Civil Rights Under Law, which has been fielding voters’ complaints from across the country since the primaries, ramped up its efforts on Election Day. The group brought in 4,500 legal volunteers and 2,500 grassroots volunteers to help answer questions from voters calling into their Election Protection hotline. They can be reached at 866-OUR-VOTE (English only), 888-VE-Y-VOTA (English/Spanish) and 888-API-VOTE (English, Chinese, Vietnamese, Korean, Bengali, Hindi, Urdu and Tagalog). The group had taken more than 5,500 calls from voters experiencing issues casting their ballots by 11 a.m.
You can also submit polling problems here. 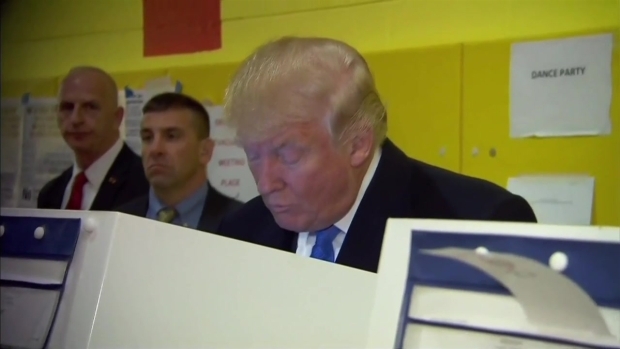 Republican presidential nominee Donald Trump headed into a Manhattan school Tuesday with his wife Melania to cast his vote. Voting irregularities and problems were so extensive across the five boroughs during the primaries that New York Attorney General Eric Schneiderman opened an investigation into the New York City Board of Elections. Schneiderman's office said its voter hotline had received more than 1,000 calls and emails on primary day, with complaints ranging from issues with participating in a party primary to unclear instructions and accessibility issues. The number of complaints was the most the attorney general's office ever received, dwarfing the 150 messages the office received during the 2012 general elections.